Tonnages: 13,545 gross, 8,086 net, 22,200 deadweight. Main Dimensions: 527.7 x 75 x 32 feet. Cargo Handling: Fitted with three electric deck cranes of 15 tons SWL suitable for grab handling. Engine: Two 12 cylinder Ruston & Hornsby medium speed oil engines, 12,000 bhp 15 knots. 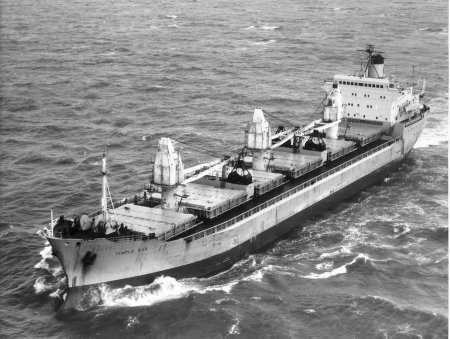 April 1971: Completed by Upper Clyde Shipbuilders (Govan Division Yard No. 101G) for Lambert Brothers (Shipping) Ltd., London. Scottish Ship Management Ltd., Glasgow, managers. 1974: Re-engined by Amsterdamsche Droogdok Maatschappij, Amsterdam with two 9 cylinder Stork Werkspoor Diesel 9 TM 410 Medium Speed Engines. 12,000 bhp 15 knots. 1975: Management transferred to Whitco Marine Services Ltd.
1976: Sold Nipigon Transport Ltd., renamed LAKE NIPIGON Canada flag. Arrived Singapore 14th November for lengthening for service on Great Lakes and St. Lawrence seaway. 1984:	Renamed LAKETON. Same owners and flag. Carryore Ltd. managers. 1986:	Sold, renamed LAKE NIPIGON. 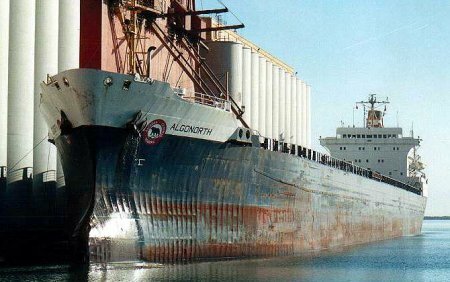 1987: Sold Algoma Central Corp. Algoma Central Marine, managers. Canada flag, renamed ALGONORTH. See photo below. 1999: Owners became Canada Inc. Flag and name retained. 2012: Broken up at Sault Ste. Marie. Photo supplied by Steve Hill (Electrician), Algonorth photo supplied by Iain Benzie.